【High Quality Hardwood】100% handmade by wood and wood laminates. 【Refined Painting】Its outer map Hand-painted surface spice up the very concept of wine cabinet, which is refined and graceful. With nearly or distant always looks at a surprise. Smooth rolling casters that can be moved anywhere. Interior storage and lower shelf. Interior hand-painted frescoes. 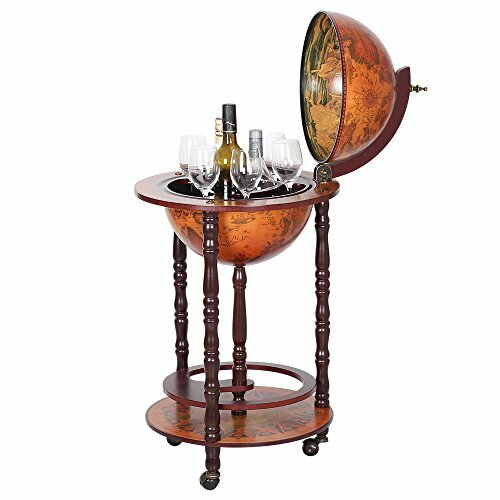 【Easy Moving】This wine cabinet has 3 wheels for easy moving from room to room. 【Collection of Wines】For the wine lovers, a suitable wine cabinet is very important to protect the wines they have collected. You may have never thought how free the wine cabinet can turn open upward. The quality 16th-century Italian replica globe features a Wood and Wood veneer construction. Smooth rolling casters make transportation easy. Handsome turned legs add to the authentic look. 【Size Info】Size of this wine cabinet is 17"X17"X35"(L×W×H), bottles and glasses of wine can be placed in not only in global but also on base plate.